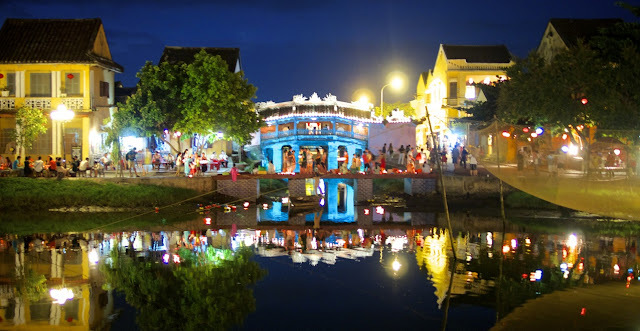 Before coming to Hoi An, we had heard majorly romantic stories about it from other travelers, and were excited to find out what all the fuss is about! Because there is no train to Hoi An, we took an overnight train to Danang and then needed to find our way to Hoi An. Getting off transit in SE Asia has proven to be a bit of a challenge. After a long journey, you step off the bus/train and are immediately bombarded with taxi and bus offers, some of which may be scammy. We finally figured out the best game plan (short of figuring out our destination the day before, as would be REALLY smart!). We bust through the throngs of offers and find the nearest Vietnamese Coffee at a cafe with wifi and re-center ourselves over a thick dose of caffeine. Best new plan ever! We called our hotel in this case and they sent a car to pick us up for the 40 minute drive to Hoi An. There is a cheaper public bus, but we had read many stories about how they significantly overcharge foreigners and if you stand your ground and pay the official fare, they may kick you off the bus partway to the destination if they find another tourist willing to pay the inflated fare. We decided it wasn't worth saving $10 to end up on the side of the road halfway to town, so we enjoyed our private car instead! By day, Hoi An is a shopper's paradise. It used to be an essential port for trade, and you can see the French, Chinese and Japanese influences in the architecture and food. But now, each building in the old town boasts a shop for tourists, selling tailor-made clothes, art pieces, lanterns, or other souvenirs. It can be tough to see the charm walking through town while being propositioned by every single shop you walk by! Any annoyance about this disappears as the sun starts to set, though, because Hoi An is magical at night. 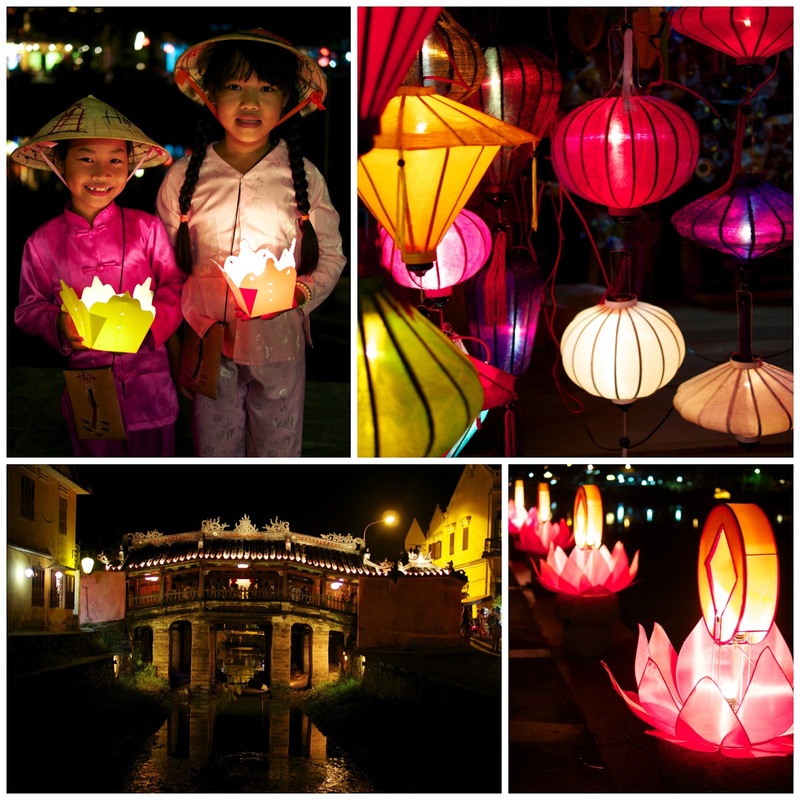 There are lanterns lit up everywhere, in windows, hanging over the streets, and floating down the river. Sure, people are still trying to sell you stuff, but the sheer beauty of this lit up little town is so incredibly romantic, it's easy to ignore any negatives. 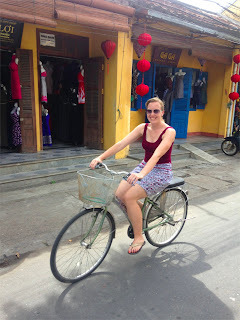 On our second day, we learned that the best way to enjoy Hoi An is to get a bicycle during the day - a ride out to the rice paddies on the edge of town are easily accessible and you can just cycle down along the men and women harvesting the rice, and the children fishing for lunch. By 9am, it was so hot we felt like we were tourists on the surface of the sun, but it was such a wonderful adventure getting to see the area without being sold stuff. And we learned that bicycling through town meant we were fast enough past the shops that we were no longer sales targets. Success!! 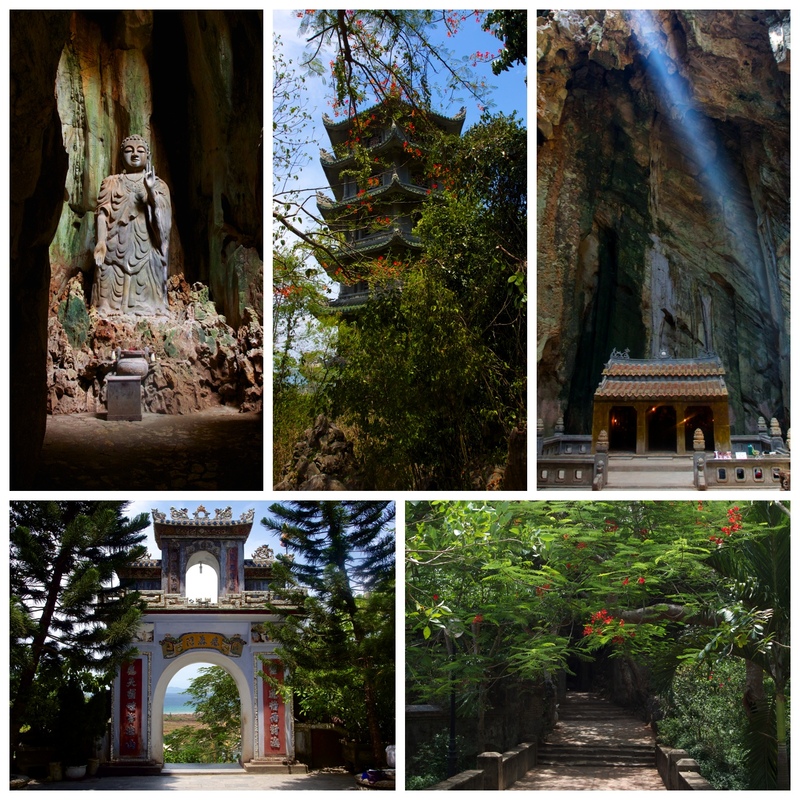 Our third day, we upped the adventure ante a bit and rented a motorbike to see the Marble Mountains. We weren't sure exactly what we were in for, but we had heard about these mountains between Danang and Hoi An and thought we'd make a day of it. We arrived at the Marble Mountains and started walking up to the top (which would only have been more fun if it was miserably hot out...oh wait, it was!). Thinking we were going for a hike up a mountain to see a pagoda, we were shocked to find natural caves in which Buddhas and temples have been carved into the caves themselves. It was absolutely stunning, and well worth the trip!! Throughout our adventures in and around Hoi An, we had the wonderful opportunity to sample Hoi An's local cuisine. Hoi An seems to have more local delicacies then most any other city we have been to; one dish that we will sorely miss is Cau Lao. It has heavy Chinese and Japanese influence and is a dish found only in Hoi An (the noodles are made from the water in the town well, and therefore cannot be authentically made anywhere else in the world). The noodles are a chewy rice noodle about the thickness of udon which are sitting in a small amount of intensely flavorful pork broth. 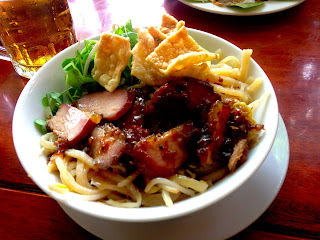 On top are bean sprouts and slices of soy glazed bbq pork, pilled on the side of the bowl is a mix of fresh herbs, then the dish is finally garnished with a couple crispy pork rind crackers. A perfectly balanced and absolutely delicious dish!! Cafe 43: a super cheap cafe with great food (and $.15 fresh beer!) right next to our hotel, on the north side of the old town. Friendly service, good prices and yummy dishes...we ate here so many times I can't count! Morning Glory: a wonderful, more upscale restaurant right in the middle of the old town. You need to make a booking, as they definitely fill up. We had two dinners here and were so impressed! We especially loved the do-it-yourself pork roll appetizer and the stir-fried bean sprouts and baby celery. We ordered it because of the awesome menu description ("sprouts are considered excellent for detozifying the bowel but bean sprouts have the added benefit of enhancing one's romantic feelings", but we kept ordering more because it is incredibly delicious! 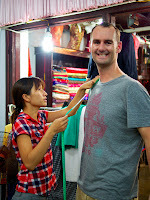 New World Tailor: (70 Nguyen Thai Hoc St, Ph: 0510 3911 913): we went to a few different tailors in Hoi An and this was by far our favorite. Excellent prices, great (not pushy) sales people, and great finished products! We got dress shirts ($17) and shorts ($20) made and are so happy with the results!